Compression tanks are designed to absorb expansion forces and control the pressure in heating/cooling systems. This tank is the oldest style design and works well when the air is controlled and kept in the tank, not in the system. The compression tank has been used for many years and works very well in specific systems. Using a plain steel expansion tank makes the system an air control system. The air volume or air cushion above the water level in the tank must be controlled. The common face between this air cushion and the water in the tank allows the air to be absorbed by the water. If the air is not removed properly from the water and placed back into the air cushion, the compression tank will become waterlogged. Plain steel tanks have a common interface between the liquid, water, and the air in them. This interface allows the air to be reabsorbed by the water and thus must be controlled by use of air separation devices. Plain steel tanks must be installed above the air separation device to enable the separated air free passage back into the tank. The size and total tank and water weight must be considered during construction. Plain steel tanks are installed in the system with air at atmospheric pressure. This air will be compressed by water as the system is filled and brought up to minimum operating pressure or fill valve pressure. This filling action will fill the tank approximately 50% full or more before the system is put in operation. This increases the size of the tank and adds to the total weight. The NA Series Compression tanks are ASME plain carbon steel expansion tanks. They are designed to absorb the expansion forces and control the pressure in heating / cooling systems. 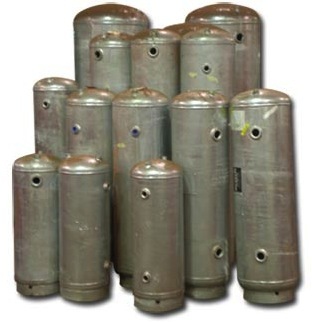 The NAG Series Compression tanks are ASME plain carbon steel expansion tanks. They are designed to absorb the expansion forces and control the pressure in heating / cooling systems. Please consult the factory for information regarding this model.